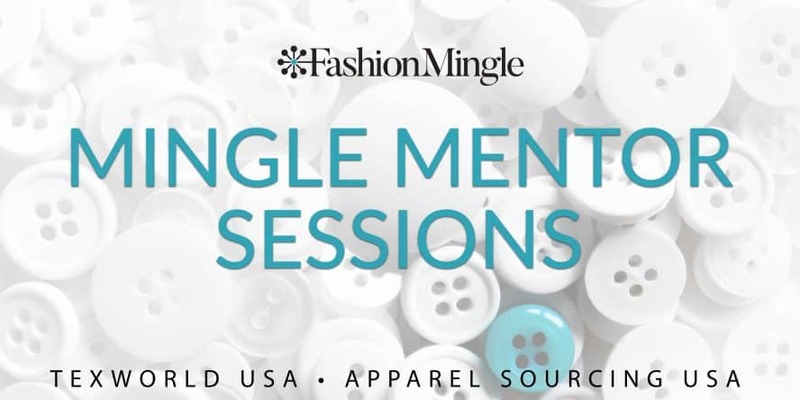 Fashion Mingle will bring Mingle Mentor Sessions to Texworld USA January 21-23, 2019 at the Jacob K. Javits Convention Center in New York. The international fashion directory and networking platform will host 6 fashion industry mentors at booth A23 designed to connect fashion designers attending Texworld 2019 with information and resources to grow their brands. Mentors include experts in production and PR and will meet with registered attendees for one-on-one mentoring sessions. Mentors in production include Nils Chaplet of Xoomba, producer of organic, fair trade cotton and Elisa Koizumi of Custom Collaborative who trains low-income women and immigrants to provide small batch manufacturing. Christy Hutchins of CZH Consulting will share expertise in product development. Designers or industry professionals that wish to attend Texworld USA can register for free admission with Fashion Mingle online and will be given access to the trade show and the program of events held during Texworld 2019. Fashion Mingle is offering Texworld 2019 attendees a discounted rate for VIP membership at $199 (normally $249). Attendees can take advantage of a Fashion Mingle hotel discount at ROW NYC saving 15% and free wifi here. The collaboration with Texworld USA serves as part of Fashion Mingle’s wider initiative to provide targeted educational and networking opportunities to match fashion industry professionals with the resources they need to grow their business and maximize the benefits of attendance at events like Texworld and New York Fashion Week. Fashion Mingle hosts a series of networking events each season of New York Fashion Week billed at NYFW Networking Week, which features Influencers Unscripted panel discussion and cocktail party, NYFW Networking Party, a red carpet event featuring speed networking, and Mingle Mentor Sessions designed to connect fashion designers in town for NYFW with fashion industry experts. The Texworld USA + Apparel Sourcing USA trade show is free to attend if you’re a fashion professional and will showcase over 200 exhibitors specializing in unique fabrics, embroidery, trim, and accessories that will make your collection stand out. Seminars are held during all three days by industry experts in textile trends and business development.